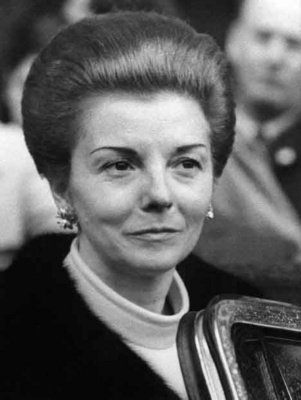 June 29th 1974; Maria Estela Isabel Martinez de Peron has been sworn in as interim leader of the Argentine Republic. Her husband President Juan Peron delegated responsibility after doctors said he required 24-hour medical attention and rest. Mrs Peron, a former cabaret dancer, was Argentina's first female president and at 43 the youngest Latin American head of state. Her 78-year-old husband has not been seen in public for two weeks and is reported to be seriously ill with bronchitis and influenza. In a state broadcast, Mrs Peron said her husband was "conscious that his state of health prevents him from directly attending to government affairs until his recovery". Mrs Peron, known to the Argentine public as 'Isabelita', is Juan Peron's third wife and became vice-president after his return to power in September 1973. The couple met in a night club in Panama during Juan Peron's years of exile after being ousted from power in a military coup in 1955. Argentina's main power groups, including the armed forces and labour unions pledged Mrs Peron their support.